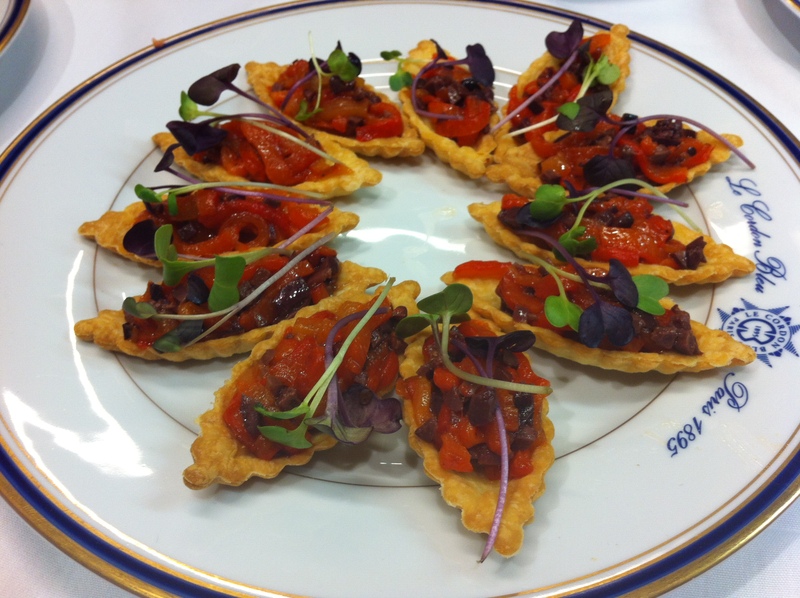 Canapes and a seasonal salad with a Roquefort dressing are on the menu. 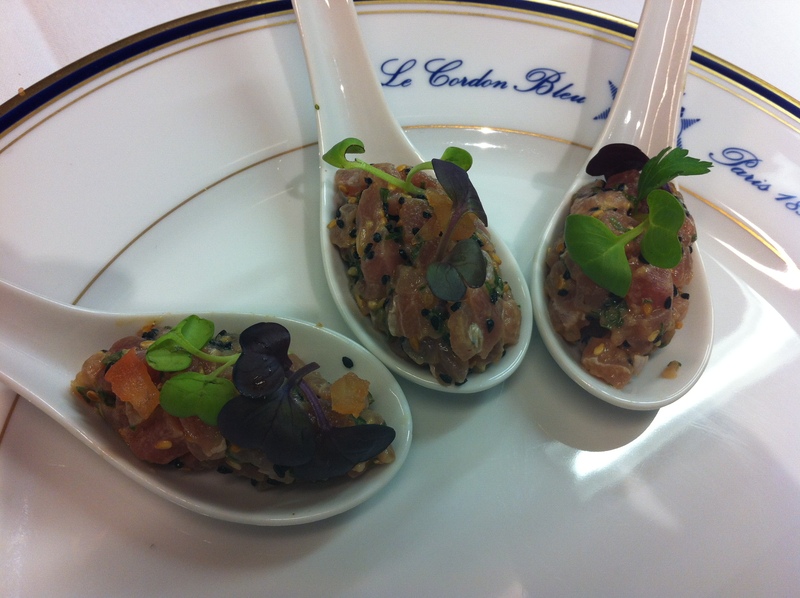 Tuna is one of my favourite fish so I’m looking forward to making Tartare de thon sur cuillere, tiny squares (brunoise) of tuna mixed with herbs, toasted seeds, ginger and other tasty morsels like Wasabi (the real kind) and served on Asian spoons. 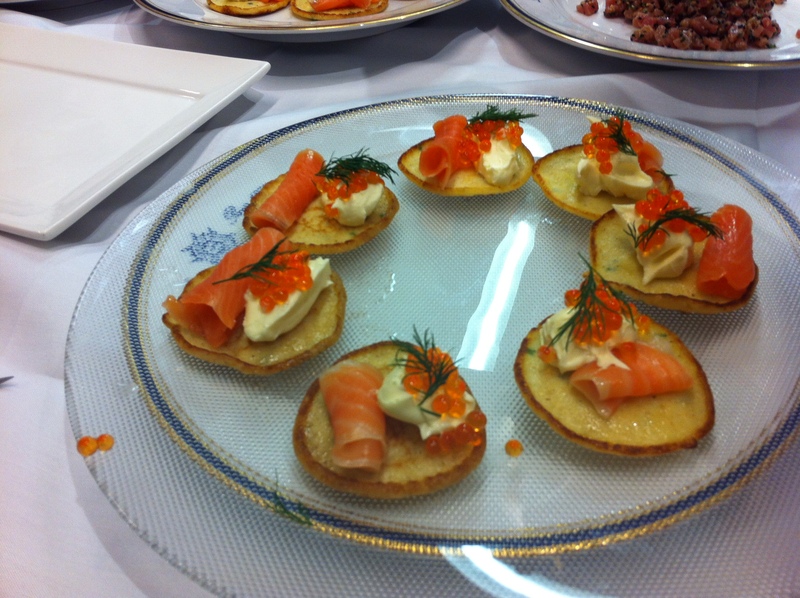 We’ll also be serving tiny pastry boats brim filled with julienne roasted peppers and chopped olives, potato pikelets with salmon, dill and sour cream, and a Salade verte saissonniere dressed with Roquefort dressing. I watch Chef Francis get everything ready. Other students’ faces are rigid with concentration and there’s frantic note-taking. There is heaps of preparation. Everything that’s chopped and sliced has to be even. It’s even clearer today why this is Intermediate. There are numerous traps to watch out for. Presentation is going to be really important. The pastry has to be crisp. The potato pikelets must be golden brown and of course cooked through. 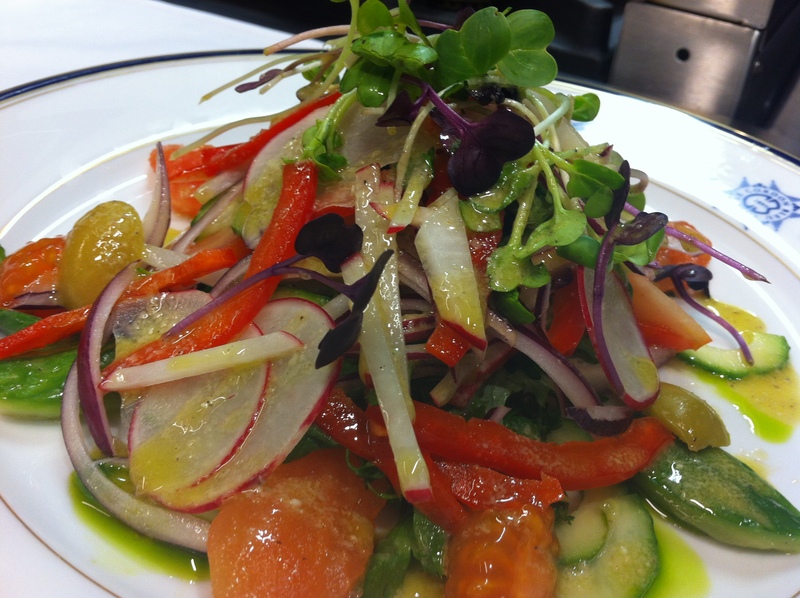 And Chef’s salad looks like something out of Dish magazine. By the time I’m in the kitchen, I have a clear idea of what needs doing. Funnily enough I’m most anxious about the salad. There’s so much work involved in getting it to look like Chef’s. In the demo he delicately dressed nearly every individual component. He compiled it with such care. But first I get the pastry done for the Barquettes aux poivrons et aux olives. I am relieved that I have spent so much time over the past year making pastry. I love eating it, you see. The roasted peppers which will be sliced and combined with the olives are beautifully blackened and the skin peels off like a glove. I’ve got seeds everywhere though so take time out to have a good clean up. I peek at other workstations around me – Spotless! It’s all a bit rushed at the end of class. I cook the pikelets, fill the barquettes, and make the salad before spooning the mixture through the tuna. It seems really dry. I check the recipe. Yes, everything is in the bowl but I add a little more soya – Big Mistake. When tasting time comes Chef nearly spits it out. “Did you not taste this?”, he asks me. Ah yes Chef, but before I added more soya. It is too salty to eat. Not for the first time Chef Francis reminds me to taste taste taste. The rest, all good, except for the presentation of my salad. I leave school after my first three days back thinking that I must take more care and remember to taste more often. Such a hardship. Doing well though Heather. It had to be a step up or you’d be bored! Yeah right, such a hardship! Well done for getting through, love the drama in your posts as it makes me feel I’m right in the room with you :o) That buttometer is worryingly high! Sounds Devine! Can you add some comparison photos of the chefs dish and your dish? Ummm, I’ve been waiting for someone to raise that point. It’s such a panic at the end of class to get everything ready to present to Chef that I always forget to take a photo. I will make a point of doing so this week.